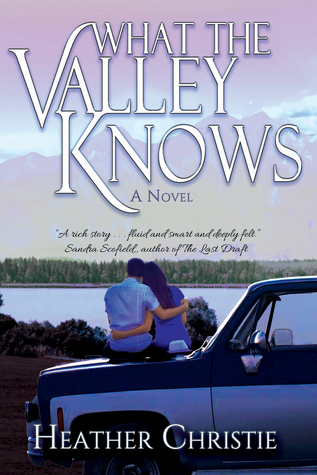 What The Valley Knows by Heather Christie. Publication: January 25th 2018 by Black Rose writing. This book has some intense and mature elements. There is drinking and drugs. There was a moment when something happened, and I wanted to look away or fast forward from my kindle, but it was one of those moments where you want to look away but you can’t! This story is sticking with me now days after I have read it. I haven’t really been able to figure out how to write the review. What the Valley Knows is not the kind of book you read to escape reality for a while, due to its intense nature. I liked it, though. It kept my attention right from the beginning with the accident.It's just really intense! I think there is a thriller component to the story too! We go back to see what led up to the accident and what happened after it. We have Ann’s point of view in third person (Ann is Molly’s mom), then we have Wade’s POV and Molly’s POV. I gave the book four stars, because I wanted to see more of the healing afterwards and see where both Wade and Molly end up and how they do. I also wanted to see the Sheriff date Molly’s mom so that she would have a stable person in her life. Molly’s accident with Wade leaves Molly with amnesia and facial issues, too many to delve into here, but she doesn’t feel the same after and wants to shut everyone out. With time, she heals both physically and mentally. When the memories all come back to her, I wanted to shout, “You go, girl!” with how she dealt with it! If you like books with mature elements, making you think, drinking, rehab, good vs evil, babysitting, doing the right thing then this might be for you! Heather Christie grew up in rural Pennsylvania and, at age seventeen, took off for New York City in hopes of becoming a movie star. Flash forward several decades, a couple degrees, a bunch of cats, two kids and one husband later, she’s back in Pennsylvania writing her heart out and chasing dreams again. She loves to read, run, drink tea, and make Sunday dinner. I love the cover.Can't wait to read it. I would like to give thanks for all your really great writings, including What The Valley Knows. I wish the best in keeping up the good work in the future.